This is the Olight X7 Marauder sent to me for review by Olight. No other compensation other than the light was received in return for my review. First let me post the links for the Olight site for the light and the Amazon Link. Also Olight asked me to mention they are having their Black Friday sale from November 24th thru the 28th with 20% to 35% off. I think I covered most everything in one portion of the video or the other , but I will just make a few notes here. The light came well packaged in a padded mailing envelope and then the box the light itself comes in is also well padded. Everything was neatly in place when both were opened and the Olight box is very well made for a cardboard box and even has a magnetic closure on it. The second thing I would like to mention is the moon mode on the light. I don’t know of any other companies that put the moonlight mode on their big flooders or throwers and it can be a useful mode to have instead of needing another light because the low is too bright for up close or what have you. The overall build quality of this light is excellent with a nice feel , near perfect semi matte finish (anodizing) , nice machining , good threads and fit and just overall nice appearance. I also mentioned it in the video but, you need to use only high drain button top cells , as the flat tops wont make connection and protected cells just don’t have enough to give the power needed for this light to operate properly. I did forget to mention also , the X7 has manual lockout by turning the tailcap slightly as well as the electronic lockout. I really don’t have anything negative to say about this light at all. 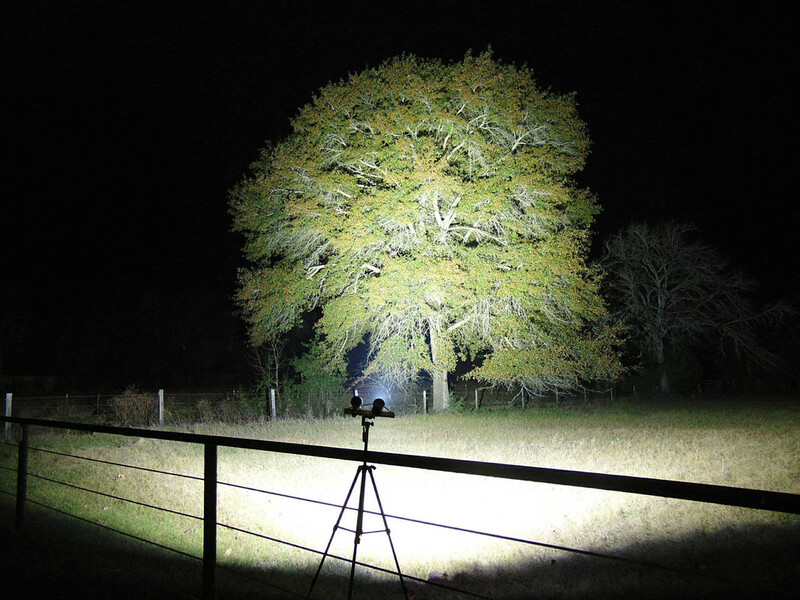 This compact little triple emitter XHP70 is a total beast of a light. It is literally like having broad daylight all around when you hit the Turbo S mode and not far from it in the turbo mode. There are ALOT of pictures of the light and quiet a few beamshots in the slide portion of the video (starting at 13:38 of the time line) and following that is the live outside footage (starting at 18:29) Note my cheap video camera is not the best quality and with the mist in the air last night it made the quality of the video even worse. The live video footage DOES NOT do justice to the output of the X7 at all. The still shots are pretty close to what I actually see out there , although the 25 yard beamshots seem a little overexposed as I had trees and bushes all the way around as well as overhead making the light seem even brighter in turbo and turbo S modes. 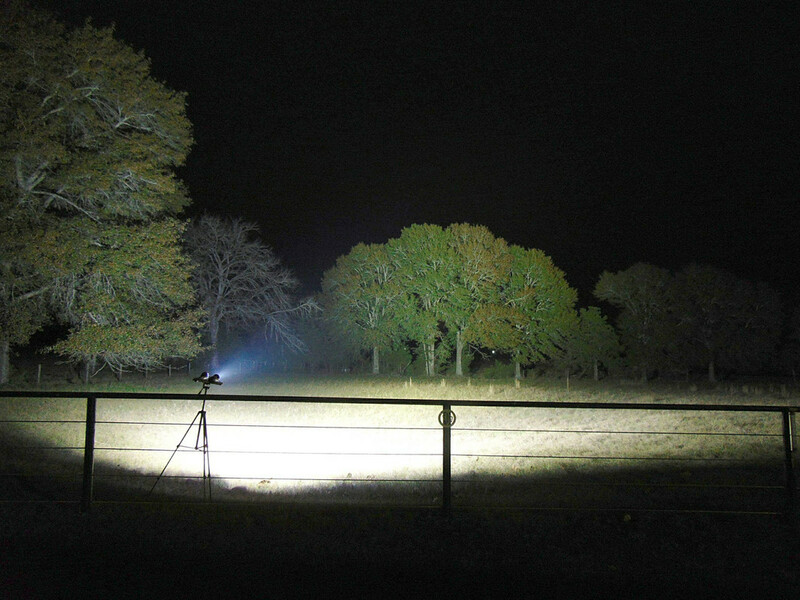 Video followed by the listed specs……………..
Level 1 ◦9000 lumens – 2.5 min. ◦ 1800 lumens – 200 min. Level 2 ◦5500 lumens – 8 min. ◦1800 lumens – 215 min. Level 3 ◦3000 lumens – 32 min. ◦1800 lumens – 200 min. Compatible Batteries 4 × 18650 HDC (High Discharge Current) for reaching maximum level. Just wanted to add a couple of beamshots I took with my NEW camera. The ones in the video show the beam pretty good , but these 2 pictures really show just how much coverage area the X7 has and they came out really clear and really close to what I actually see out there , as far as the actual colors and everything. Thanks , I been struggling to get decent shots with a little point and shoot for a long time. This new camera does most of it for me. You must be quite pleased with your new camera then. We’ve all seen plenty of low quality beamshots; it’s amazing what technology can do. These two pics really show the power of the X7 well, and at the same time also the “flaw”. The spill beam right in front of you can be too bright; that’s why you often gotta hold the light as high as possible when shining to reduce the spill brightness. At least, that’s what I do with the Meteor (don’t own X7). Yes I am happy I have a decent camera to take beamshots with now for sure.